The latest in the Boutique range is the result of an unexpected collaboration between Roland and Studio Electronics. After a couple of tentative efforts, Roland seem to be getting the hang of collaboration. In 2015, the company struck up an arms-length relationship with Reon and a somewhat less hesitant one with the strangely named Malekko Heavy Industries. But while few seemed to understand the point of the Reon Driftbox-R, the Roland/Malekko System 500 — which is described as “built in the USA and assembled in Japan” — was an unmistakable homage to the Roland System 100M. 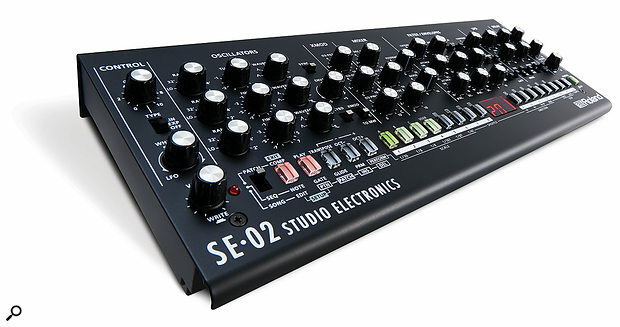 Today, another collaboration (which, according to Studio Electronics, comes from long-standing friendship and mutual respect between the two companies) has given birth to the SE-02, which marries a Studio Electronics monosynth to a digital sequencer and delay within the diminutive form of Roland’s Boutique package. Mind you, delving a little more deeply shows that the voicing in the SE-02 is rather less analogue than it first appears, with digital technology used in the tuning mechanism, the contour generators, the LFO and the portamento. 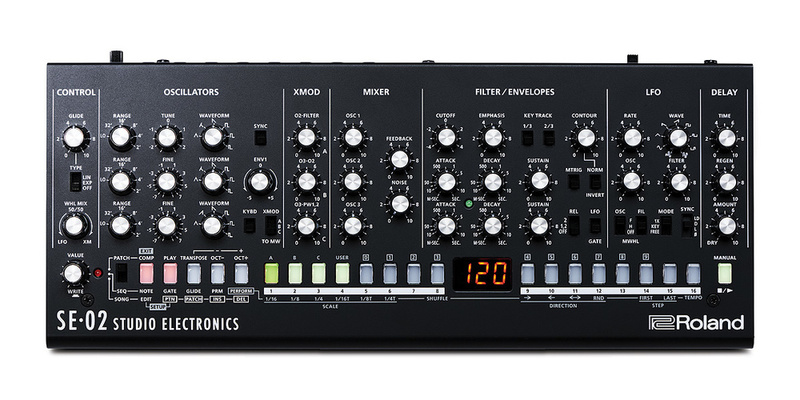 This makes it a hybrid analogue/digital synth with an analogue signal path, which doesn’t bother me at all, but clearly makes Roland uncomfortable because they have chosen to overlook this in all of their product descriptions. Given Studio Electronics’ history of creating Moog-inspired synths comprising analogue signal paths controlled by digital modulators and contours, I was intrigued to see how far this particular apple had fallen from the tree. Described by Roland as “the debut product of the new Roland Boutique Designer Series”, the SE-02 uses the same case as previous Boutique modules, to the extent that it’s compatible with the K25m keyboard unit and the DK01 Boutique Dock. It also shares (for better or worse) things such as the 3.5mm sockets for its audio I/O. But you only have to spot the socket for a 9V DC power supply to realise that it’s different from the other Boutique modules... because it has one! While the previous models could run on the power supplied by a USB connection, the hungrier SE-02 cannot. Visually, the SE-02 appears to be a response to the current craze for all things Minimoog-ish, and things such as its oscillator and filter structures as well as its ADS(D) contour generators make the comparison unavoidable. I therefore wondered whether it would feel and sound like a miniature but extended version of the Minimoog, and placed it next to my Minimoog to test it. As you can see, it incorporates three oscillators, implemented as VCOs but with a digital tuning mechanism, which isn’t quite the contradiction in terms that it sounds. The six waveforms available on each (including the substitution of a ramp wave for the shark’s tooth wave in osc 3) are identical with the Moog’s, as are the footages, the fine-tune controls for osc 2 and osc 3, and the switch to disconnect osc 3 from the keyboard CV. Testing each of the waveforms with the filters wide open and no modulation or effects applied revealed that the underlying waveforms and tones are very similar to the Minimoog’s, although perhaps not quite as similar as emulations from elsewhere. I’m not surprised; just before submitting this review, I discovered that Studio Electronics have incorporated elements of Oberheim and ARP technology in the SE-02’s oscillators. Other differences are more apparent. Some are operational, such as the master tune knob migrating from the Controllers panel on the Moog to the Oscillators panel of the SE-02, where it’s far too easy to nudge accidentally and send the whole instrument out of tune. But more significant are the additions to the oscillator architecture, including oscillator sync of osc 2 by osc 1, with the filter envelope sweeping osc 2 to obtain the usual range of aggressive hard-sync timbres, plus three cross-modulation options controlled using the dedicated XMod panel or the modulation wheel. The range of possibilities provided by these — individually or in combination — is immense, and the SE-02 is capable of generating sounds that no unmodified Minimoog ever could. Next in the signal chain lies the mixer, which seems to offer level controls for five signal inputs. However, its appearance is deceiving because, where the external input volume control would lie on a Minimoog, there’s a knob to control the gain of a feedback loop (derived from Studio Electronics’ Boomstar range) that connects the output from the VCA to the mixer input. At low gains, the sound can become fatter and more assertive; at high gains with high signal levels it can pass through downright obnoxious all the way to out-of-control axe-wielding maniac. Consequently, any audio presented to the SE-02’s external signal input is injected into the signal path without any user control over its level. Oh yes, and the Minimoog’s white/pink noise switch has also been lost, and only white noise is generated. Now comes the combined VCF/VCA section. This again mimics the Minimoog, with cutoff and emphasis controls for the 24dB/oct low-pass filter, and two switches to apply zero, 33, 67 or 100 percent keyboard tracking to the filter cutoff frequency. The Moog’s ADS(D) filter contour generator is also emulated, but now with an ‘invert’ option plus (yippee!) a multi-triggering option. I found that the filter itself sounded similar to the Minimoog’s, but with one obvious difference: the self-oscillation of the SE-02 filter goes down to 50Hz (which also seems to be the lowest cutoff frequency) while that of the Minimoog tails off at much higher frequencies. This means that some of the Minimoog’s characteristic bass sounds cannot be precisely replicated. The VCA contour generator is also an ADS(D) device and, since there’s no performance panel, this is where you’ll find the switch to apply the decay time as a release phase. However, unlike the Minimoog, the SE-02 allows you determine whether the amplifier contour alone has a release phase, or whether both the filter and amplifier contours are affected. Another switch allows you to choose whether the rising edge of a gate signal (generated from a MIDI Note On or an incoming analogue gate from elsewhere) or the LFO triggers the contours. The fastest attack and release times are impressive, generating clicks at their minimum settings, but their slowest contour times, while not miserly, are not hugely generous. I timed all three phases on the SE-02 at around 14s, compared with around 14s (attack) and 40s (decay and Release) on my Minimoog. It’s not a problem, but will preclude unusually long, gentle sweeps. The VCA itself can be gently overdriven at high levels, which is nice. ...The last stage in the signal path, which is a simple digital delay with time, regeneration and level controls. It seems almost too simple to be important, but it sounds great, and I found myself using it much more than I had anticipated. All of the previous Boutique modules have included a sequencer, so it’s no surprise to find one in the SE-02. This is a monophonic, 16-step device that offers memories for 128 patterns that you can use to build songs of up to 16 Parts, where each Part comprises a patch, a pattern, and the number of times that the pattern is repeated. You can store up to 16 songs within the SE-02 itself, any of which you can load while a previous selection is playing. Before I started using the SE-02 to make music, I noted a number of shortcomings. The most distressing of these was the fact that the oscillators in the review model weren’t scaled correctly and, across the oscillators’ range from 32’ to 2’, went flat by around 25 cents (half a semitone). This doesn’t sound like much, but it’s only the width of a 49-note keyboard, meaning that a sound that was in tune at the bottom was flat at the top. Since the tuning mechanism is based on a signal processing routine and a frequency look-up table there are no trimmers to tweak, so there was nothing that I could do about this. I also noticed a small amount of bleed from all three oscillators into the signal path when their levels were at zero. The amounts were low enough to be masked in most circumstances, but I would nonetheless advise programmers to ensure that all three oscillators are in tune, even when not in use, to minimise the chance of any unwanted artifacts. In addition to this, the quantisation of some parameters was audible, especially when controlled over MIDI. Such quantisation has rarely bothered me; I’ve coaxed sounds I love from synths with 5-bit parameters, and the SE-02 is far more precise than that but, if you belong to the Association of Pure Analogue Fanatics, this could be an issue. Moving on, I have to admit that patching the SE-02 wasn’t always a joy. The control panel is so densely populated with small knobs and switches that I had to be careful not to nudge one while trying to adjust another. Consequently, grabbing and twisting knobs to within a few degrees of their lives during live performance isn’t likely to be the SE-02’s forté. But if you use it in the way that synths were played in the 1970s, creating the sound first and then influencing it using the performance capabilities rather than modifying the patch itself, all should be fine. Turning to operational details, the sequencer isn’t the most intuitive that I’ve ever encountered and building complete songs can be a bit long-winded. But this isn’t its greatest shortcoming, which is its seeming inability to be transposed in real-time by playing on the controller keyboard. There’s nothing in the documentation to suggest that this is possible but, hoping that it might be a hidden command, I tried dozens of combinations of controls and keys to no avail. Then there’s the implementation of the cross-modulation. You can’t disconnect osc 2 from the keyboard, yet this is the only oscillator that can modulate the filter, which means that you can’t have consistent audio-frequency filter modulation as you play up and down the keyboard. This is a departure from the Minimoog, and an unfortunate oversight if you’re into such things. Furthermore, the minimum frequency of osc 3 is too high to obtain the best from its ability to generate PWM, which is a shame. Finally, I was concerned by the ‘popping’ sounds that occasionally emanated from the SE-02 while I was editing it. I looked to see whether I was causing this in some way, but couldn’t find a reason. I hope that this is just an anomaly on the review unit, and not a systematic problem. Despite all of these concerns, I have to admit that the SE-02 will make a damn fine monosynth once its issues have been addressed. Yet some people are already complaining that it doesn’t sound like, say, an SH-101 or S-H5. This is daft. If you want the cleaner, more precise, squelchier 1970s Japanese sound, there are many other ways to obtain it, not least using Roland’s own AIRA systems and other models in the Boutique series. On the other hand, I’m not sure it feels or sounds quite like a Minimoog either. In fact, I found the layout to be a bit of a distraction because all of the SE-02’s extra facilities demand that you step beyond the Moog’s constraints, whereupon it begins to exhibit its own character — less creamy than the Minimoog but capable of much greater aggression. Consequently, it came as no surprise to find that its greatest strengths are bass and lead sounds as well as sound effects. Sure, there are things that the Minimoog does better, but there will be so much more that you can do with the SE-02 that it would be rude to complain. Happily, the SE-02 also steps far beyond the Minimoog with respect to performance capabilities. On the control panel you’ll find portamento with both linear and exponential modes, octave shift (up to ±3 octaves) and transpose functions, and there are setup functions that allow you to determine the patch volume, the pitch-bend range, the amount by which the mod wheel affects the parameters it’s controlling and, weirdly, the amount by which the filter’s contour knob determines the depth of the contour. The SE-02 also spits out MIDI CCs whenever you tweak controls which means that, if you record the resulting stream of data, you can automate the synth on playback. But for me, best of all is the provision of aftertouch, with two setup functions that allow you to determine the amount by which pressure affects the LFO depth and the filter cutoff frequency. This takes the SE-02 to a whole new level if you intend to use it as a soloing instrument. Inevitably, many people will be happy just to tweak the SE-02’s factory sounds. Others will prefer to design their patches from first principles and, for those, there’s a manual mode that allows the sound to reflect the settings of the knobs and switches on the panel, although sometimes it doesn’t seem to initialise fully, or maybe the setup parameters can influence things to the degree that you’re not sure why something is happening, or why it isn’t. Surprisingly, the SE-02 offers no fewer than 512 patch memories, 384 of which are preset, and 128 of which are user programmable. Why Roland or Studio Electronics think that you would want so many sounds that you can’t overwrite (and which, in common with almost all patches from all manufacturers, include many that are almost but not quite what you want) is beyond me. But even as I write this, I realise that I’m being churlish; had it offered 128 user memories and nowt else, I would be praising it! It will be interesting to see whether Roland continue in this direction, adopting technology from elsewhere and realising it within the Boutique concept. I hope that they do because collaborations of this sort can produce remarkable results. (For example, who would have predicted when Dave Smith launched the Prophet 6 that he would later replace its voice boards with modern SEMs to produce the wonderful OB6?) Of course, such arrangements have to benefit both parties but, in the case of the SE-02, it seems evident that it does; it’s unlikely that a small manufacturer such as Studio Electronics could have brought this product to the market at anything approaching this price, while Roland obtain access to an otherwise competing technology. So what’s next? A Prophet in a Boutique box? An ARP of some sort? Who knows? But for the moment, I can see a number of players taking the SE-02 seriously. For me, a larger version with quarter-inch sockets, a control panel that welcomes podgy middle-aged fingers, and an internal power supply would be preferable but, if you can live with the 3.5mm sockets, the dense panel and a ‘snake that swallowed a wombat’ PSU, there’s a lot that’s right about the SE-02. Once Roland and Studio Electronics have attended to the teething troubles, it’s going to be an attractive proposition. Next to the power input and its associated on/off switch, you’ll find a micro-USB socket that carries both audio and MIDI, alongside a conventional five-pin MIDI in and out pair. Moving to the right, you’ll come to trigger in and out sockets, the first of which allows you to drive the sequencer from an external clock, and the latter of which outputs the sequencer’s clock. Next come three control inputs; a 1V/oct CV input, a gate input and an auxiliary CV input that controls the filter’s cutoff frequency. The audio I/O then comprises three further sockets; an audio input that allows you to modify external audio signals, an audio output, and a headphone socket. All nine audio and control sockets accept 3.5mm plugs. The final item on the rear panel is the volume control, which really should be on the control surface. The SE-02’s setup parameters start with the MIDI receive and transmit channels, which are always the same as each other unless omni is chosen for receive, in which case the unit transmits only on channel 1. Next comes the chain mode, which allows users to chain multiple SE-02s to create a polysynth. (I think that Roland should have sent me at least six units so that I could test whether the note-stealing problem exhibited by earlier Boutique modules has been eliminated.) Next come two housekeeping commands: the auto-off time and the delay before a pointless LED demo is shown. Finally, there are the destinations to which the MIDI CCs generated by the controls are sent; you can select MIDI, USB, or both. When connected via USB to a Mac (OS 10.10 onward) or PC (Windows 7, 8.1 and 10) with the dedicated software driver loaded, the SE-02 should appear in your DAW as a USB/MIDI interface and an audio I/O device as well as a conventional instrument. The software also provides a simple backup and restore function. I’m afraid I have to mention the documentation because, in common with that provided for other Boutique modules, it’s just a folded sheet lacking detailed explanations of what does what or why, and lacking any specifications that you might find useful. Sure, experienced players will quickly find their way around the SE-02, but it isn’t quite as simple as it seems. There are some programming quirks (particularly in the area of cross-modulation and modulation via the mod wheel), and not everyone is experienced. So, while I understand why Roland have adopted the minimalist approach, I don’t approve of it. It’s a powerful monosynth that you can slip into a (large-ish) pocket. It offers much more than its Minimoog-inspired panel suggests. It spits out MIDI CCs for playback automation. It offers multi-triggering and aftertouch. It occasionally generated spurious ‘popping’ sounds. The review unit was incorrectly scaled. The panel will be too dense for some. You can’t obtain gentle PWM. You can’t transpose the sequencer in real time. Omitting any mention of the extensive digital technology in the SE-02 is a bit naughty, and has already led some commentators to describe it as ‘all-analogue’, which it is not. But, if you bypass the digital delay unit, the signal path is analogue and, if you want the sound of a fat and aggressive American monosynth in a tiny and affordable box, the SE-02 will do a remarkably good job once its teething problems are addressed.